If you’re looking for the ultimate gaming experience these are the two consoles you should consider for your household. 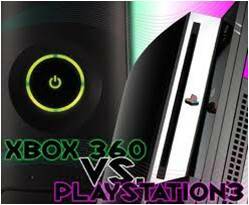 Playstation3 is a console that has been around from ages being developed by Sony. It comes with 250 GB space of memory able to bump up to 320 GB max, able to accesses the internet with ease (and is free). Also has many other functions such as Bluetooth mp3 player and able to play blue-ray DVDs. And for you people who love the gaming experience this console is HD compatible. Xbox360 comes with 250 GB max space of memory. This console is also able to connect to the internet BUT to do this you must have an Xbox live account and pay at least £5 a month to accesses the internet. Also their internet is very limited as to what you can do and browse because this console has been designed and developed by Microsoft. This console also has mp3 features able to play music while you’re playing a game. Also it can play DVDs (but not blue-ray). This is also HD compatible so allows you to experience the ultimate game experience.